Sadegh Hedayat was an iconic Iranian writer famous for his modern and dolorous prose. His demeanor, deportment, and the somber shroud of his melancholy remind me of Edgar Allen Poe. Both writers give off that noir vibe in spades. Sadegh Hedayat committed suicide in Paris in 1951 and is buried at the Père Lachaise cemetery. This gorgeous photograph is the poster of an Iranian documentary film by the name of “From No. 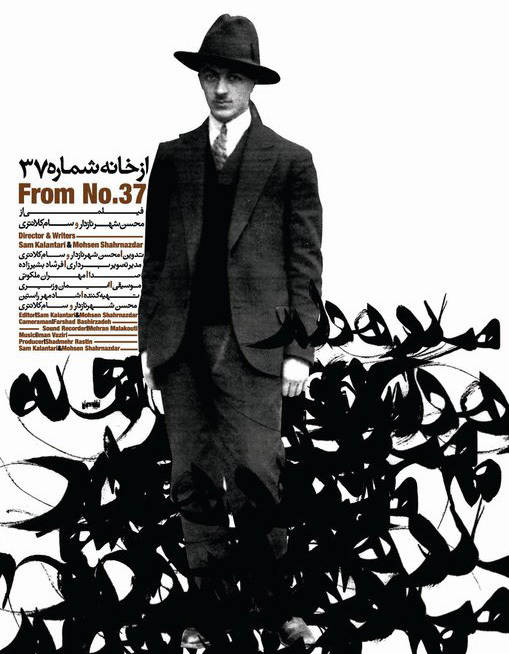 37” by Mohsen Shahrnazdar and Sam Kalantari about the writings and life of Sadegh Hedayat. I really like this poster – especially the expressive calligraphy in the background. I love documentaries and Judging a film by its poster, I hope to find and watch this one. Simin Daneshvar wrote a book called Soovashoon (often spelled Savushun) which is considered a masterpiece of Iranian literature – beautiful, poignant, tragic – with an engaging and unforgettable narrative. Every time I re-read it I’m enchanted anew and I’m heartbroken anew. She passed away a year and half ago. I can’t believe she’s gone. Zig zagging away from the literary theme with no rhyme or reason and no concern whatsoever for continuity and coherence, I finally maneuver to the topic of the post: How to Groom a Persian Cat! Excuse me while I chuckle for a bit. So here’s the story. I have horrible terrible dreadful impossible dastardly painful torturous and yes dolorous deadlines. I’m stressed out! So needless to say I value every second and that naturally explains why I spent some of that precious time Googling for images of “stressed Persian cat.” But anyhow, I did it, guilty as charged, and then this image from a pet grooming website popped up, and then I was … in love! Now mind you, I’m not entirely certain this cat is indeed Persian. It does not have that stereotypically Persian cat mien. But really, no matter, who cares. Just look at that face! Excuse me again while I go chuckle for another bit. Azita, when I open your posts I never know what to expect and – believe me – it is so refreshing. Loved your “literary presentation”. As a passionate reader, I’m always interested in knowing new writers. Hang on there. I’m sure you’ll meet your deadlines beautifully. Francesca, I do take it as a compliment! Although posting when bleary eyed and sleep deprived may not be my best course of action going forward. I personally am not the biggest fan of Sadegh Hedayat’s writings – they are rather fatalistic and pessimistic and nothing wrong with that but not entirely my cup of tea so won’t personally steer you that way but I do wholeheartedly recommend that you read Savushun. I do know that there are several English translations of it out there. I have not read it in English but I do know that a dear reader of this site was reading one of the translated versions and he’ll hopefully comment with his input. But yes, do read that one. And thank you for your always heartwarming comments that make me smile inside and out and all over. I note your deadline pressures, a delayed and/or very short answer or opinion is OK. In chapters 14 and 15 of “Savushun” Ezzatoddowleh hosts Zari for an extremely long visit and takes many hours to get to her point, which is to enjoin Zari–during one of her charitable jail visits–to pressure Nana Ferdows to conceal Ezzatoddowleh’s smuggling connections. Question: Would this extended “hospitality” be regarded as a form of ta’arof? Or just common deviousness? In answer to your question (which reminds me I long to re-read the book yet again) I would say that Ezzatodwleh’s hospitality is a clear case of someone buttering up the other person and as you so aptly put it, a clear case of “common deviousness.” Ta’rof is more like a protocol, a series of incantations of gestures and offerings and sayings, which may at times be automated or pat or not entirely heartfelt, but is never really meant to be manipulative or deceitful. Which translation version are you reading again? Would you recommend it to other English speakers? If so, let me know and I’ll pass onthe info. Thank you for an awesome comment! Wonderful post, Azita! Am now rushing to my library for a copy of Savushun. Woo hoo! I mean, if the translation lives up to the original, you’ll be in for a treat, I promise! I have two e-pub editions on my Mac, they are titled differently, which goes toward explaining that duplication. Both came from Kobo but I imagine Am*z*n has copies in its exclusive format. For no particular reason I read the Ghanoonparvar translation, but looking at the Zand one just now I’ll probably read that version sometime. I’m no literary critic but they both look good to me. You would probably need to be fluent in both languages to really make a serious judgment, although I find the available English translation of Orhan Pamuk’s “My Name is Red” (which I thoroughly recommend as a book) to be obviously poor even to a non Turkish speaker. Kobo also has Sadegh Hedayat’s “The Blind Owl” as an e-book. Thank you for the detailed & helpful info Ross. I may take the plunge and read a translated version one of these days. I’ll probably choose M.R. Ghanoonparvar’s version if only for the fact that he/she left the title intact. Wonderful post your description of both the authors and their work is beautiful and draws us in and makes me want, no, need to read these works. I have to read Savushun, it sounds amazing. 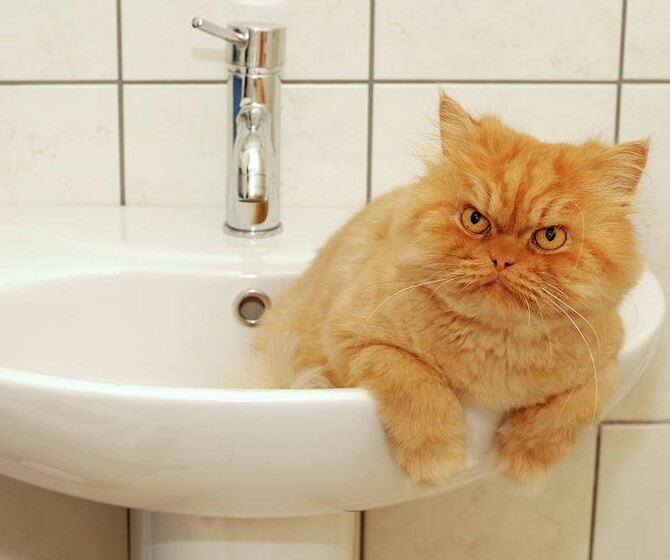 That doesn’t look like a Persian cat but it is beautiful and must say a bit grumpy looking. Google grumpy cat, he/she is famous now and the face is priceless. I don’t know much about Iranian literature and/or famous writers. I got a bit educated by the first half of your post. Very intriguing. As for the latter, I though to ask you, what did you have for dinner the night before. Saffron? Aside from the post… and being no laughing matter… the note left by ‘peppersandplums’, is it serious or a tease? I went looking for any information about film versions of “Savushun” but, despite its enormous potential, that has not happened. Maybe the new government will encourage such productions. Along the way I found a good but rather scholarly analysis. This is wonderful Ross! Thank you! I’m bookmarking it to read when I’m on the road later this week. Thanks for sharing. Interesting read, Azita. I’m reading a South African writer right now, but will bookmark this for the future.